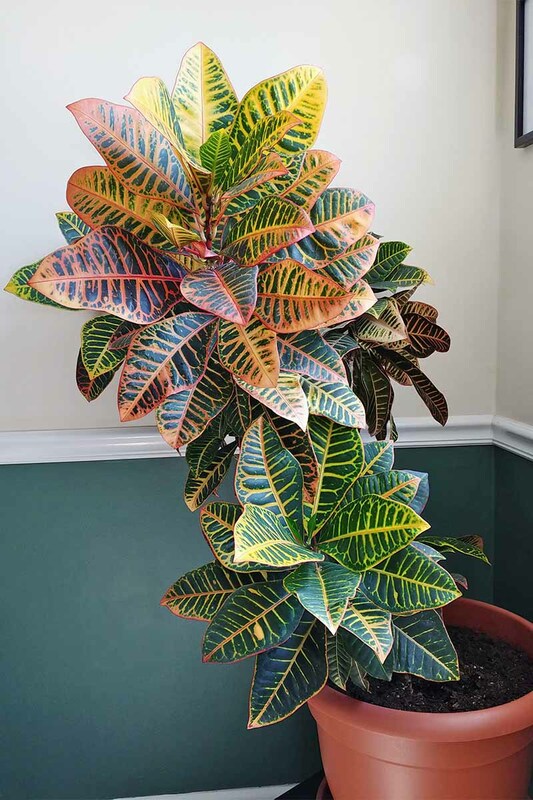 Tropical garden croton, Codiaeum variegatum, makes a spectacular houseplant. 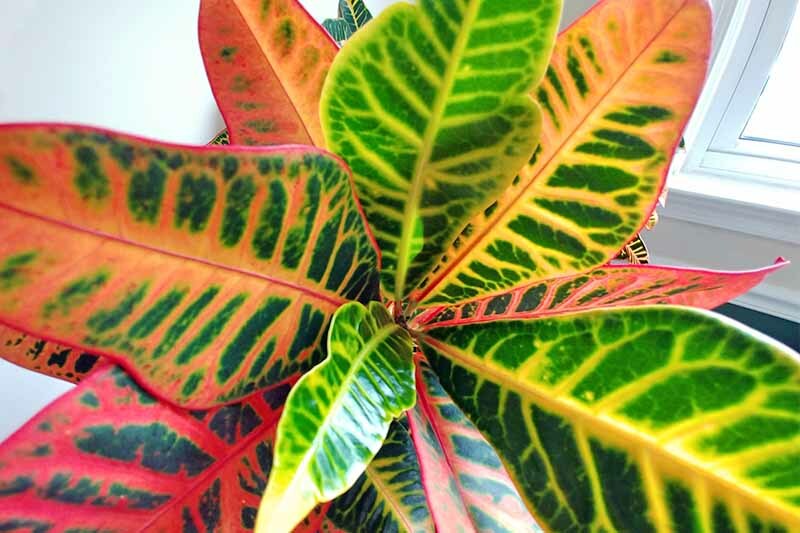 A member of the genus Codiaeum in the Euphorbiaceae, or spurge, family, it is not to be confused with the “true croton” species of the genus Croton, also in the spurge family. 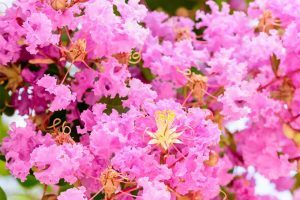 If you’ve vacationed where it’s warm and humid, you’ve probably been awed by this brightly-colored shrub. There are many cultivars with glossy, leather-like leaves in various shapes. 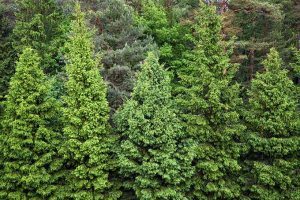 Colors range from yellow and green to red and almost black, with patches, speckles, or veins of contrasting colors. Flowering is infrequent, and consists of pendant-style clusters of tiny yellow blossoms that pale in comparison to a breathtaking backdrop of richly-hued foliage. 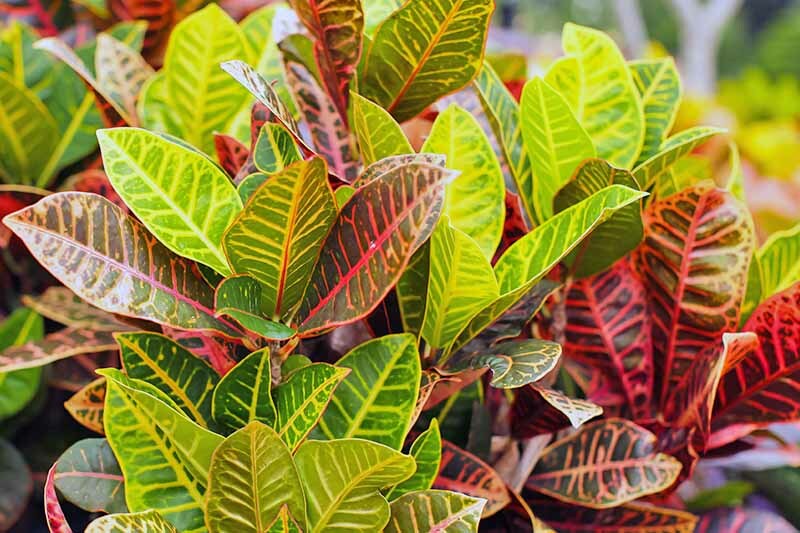 Also known as rushfoil, Joseph’s coat, and variegated laurel, this slow-growing evergreen perennial is native to Australia and Southeast Asia. 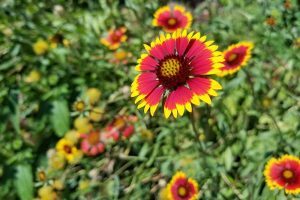 Those living in USDA Hardiness Zones 10 to 12 may cultivate it outdoors year-round, and the rest of us can enjoy it as an annual, or indoors as a houseplant. Choose a sunny placement with a south, west, or southwest exposure that is draft-free, and always above 60 degrees. 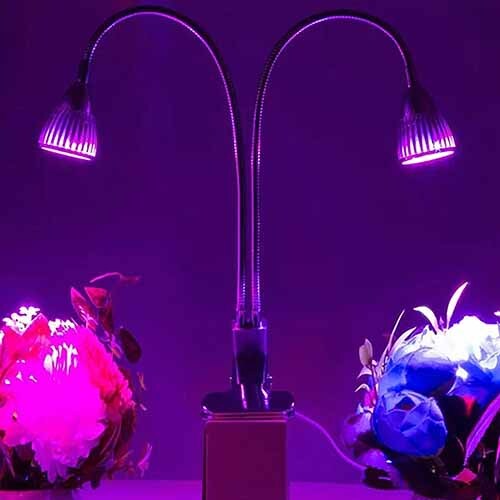 If you lack adequate daylight, you may try a grow light, like the Dual Head LED Clamp Grow Light, available from Wayfair. 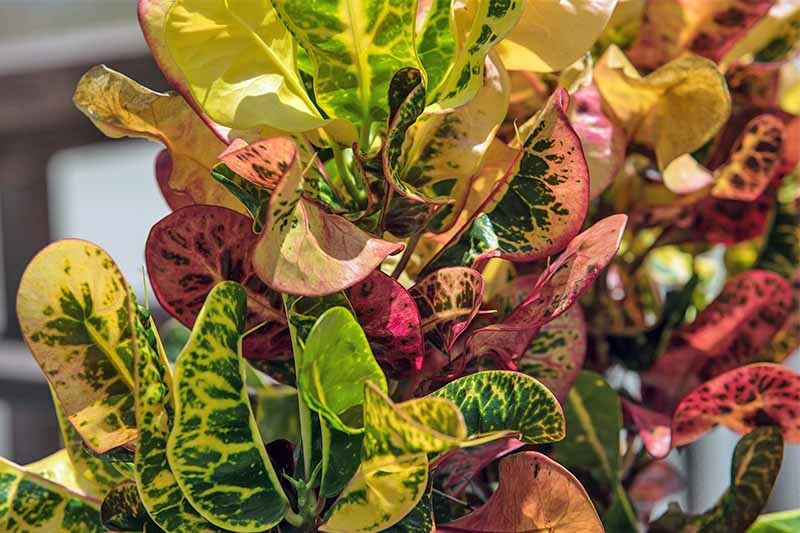 Plants that don’t get enough sunlight are likely to be less colorful. 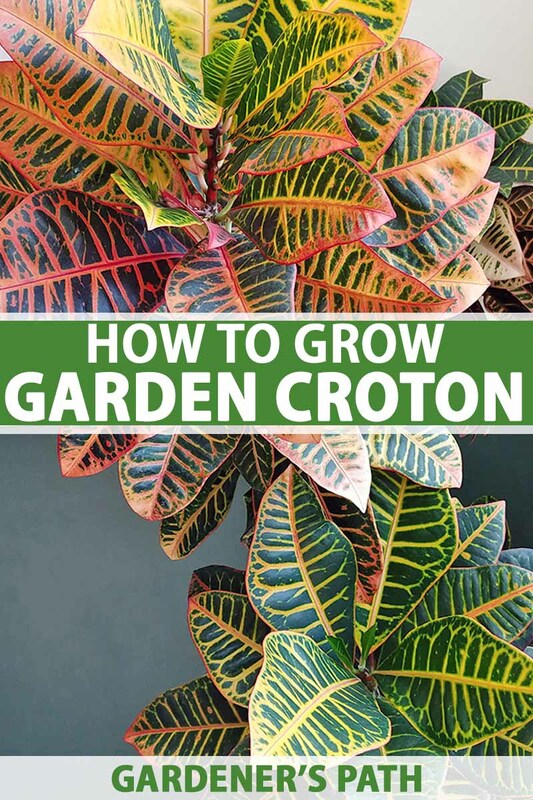 Your new croton is likely to come in a grower’s pot. If you want to upgrade to a sturdier, more decorative container, choose one with a drainage hole and a drip tray. Place a layer of pea gravel in the bottom of the pot, and fill with a good quality potting soil, such as Miracle-Gro Indoor Potting Mix, available from Amazon. 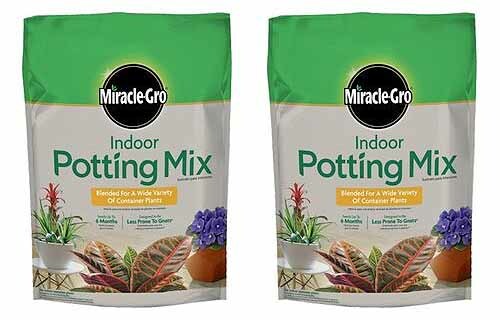 You may add a slow-release fertilizer like Miracle-Gro Indoor Liquid Plant Food, available from Ace Hardware. This is the houseplant food of choice in my family. Applying it once a month is more than adequate. 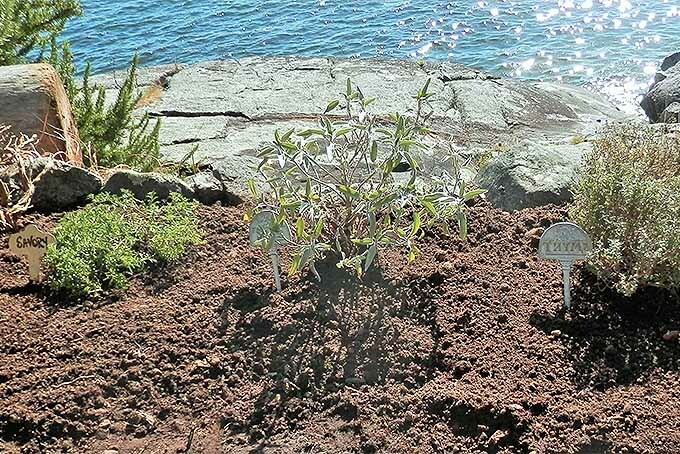 When the surface of the soil becomes dry to the touch, it’s time to water at soil level and mist the leaves. You may leave a little water in the drip tray to add to the moisture in the environment. 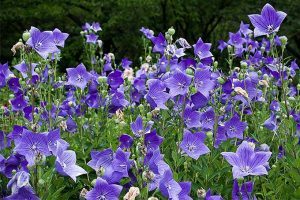 Please note that this ornamental plant is toxic if ingested, and its sap may cause skin irritation. 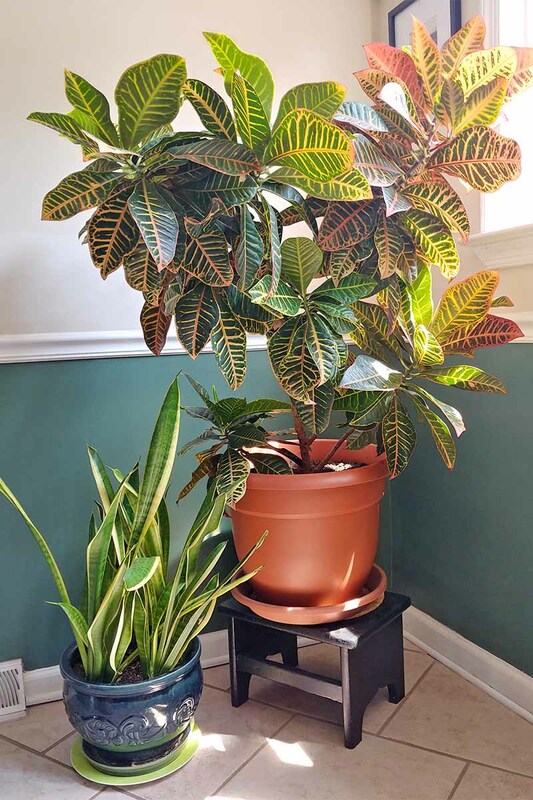 Crotons grow slowly. 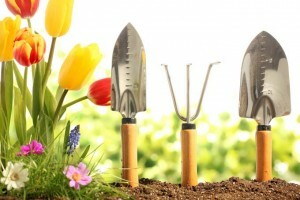 Over time, you may notice that you are watering more frequently, or that your plant isn’t as perky as it used to be. If so, may be time to repot. To be certain, examine the drainage holes. If you see roots poking through, it’s time. 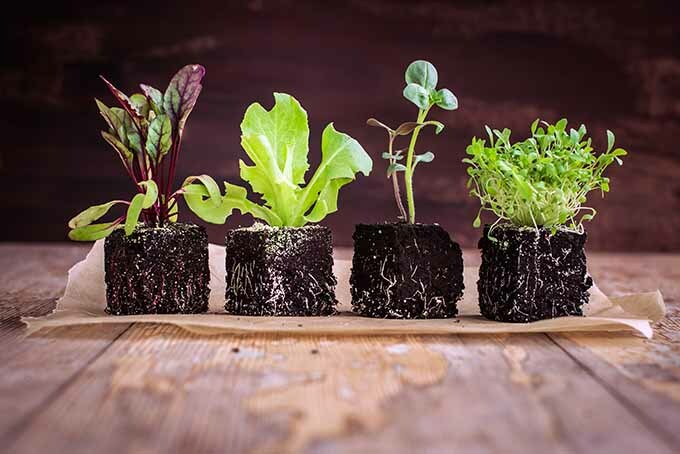 Spring is the best time for repotting, as your plant is feeling especially vigorous. This is where some folks err on the side of generosity, myself included. 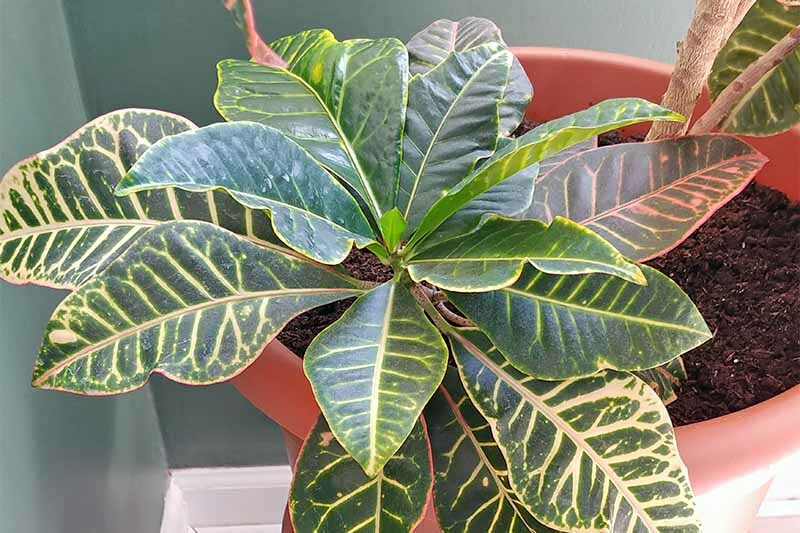 When you repot a houseplant, choose the next size up, or in other words, a pot that is only an inch or two wider in diameter than the current container. 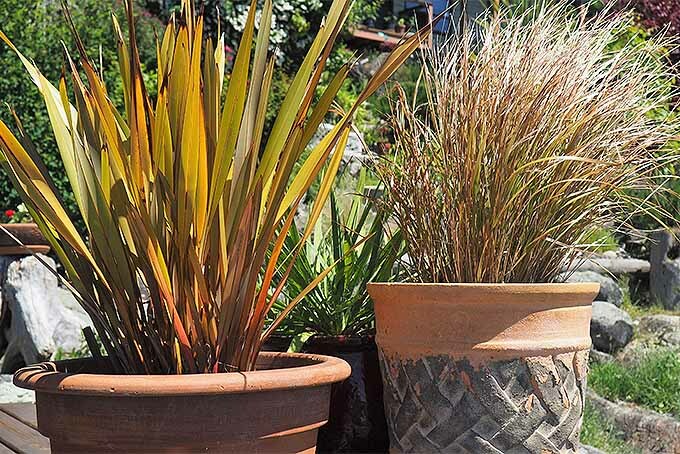 A pot that is too deep will encourage excessive root growth, rather than lush foliage. 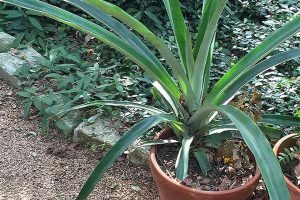 To repot, first take note of how deep your plant sits in its old pot. You’ll want to replicate this depth in the new one. 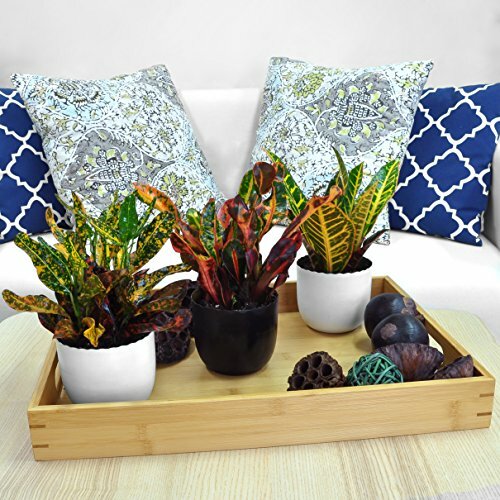 Gently ease your plant out of its old pot, dirt and all. Remove most of the old potting mix and tease the roots apart. Your new pot should be clean and have a drainage hole. 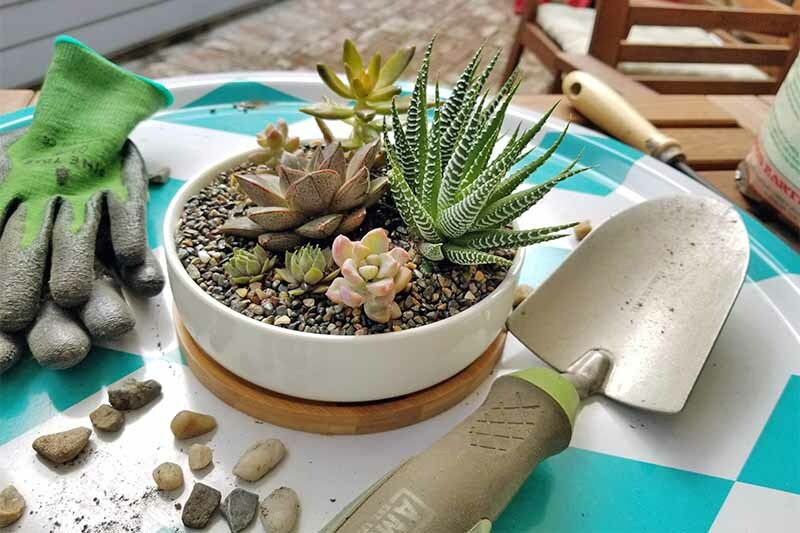 Cover the bottom with pea gravel and pour in new potting medium to a depth of about one-third the total depth of the pot. 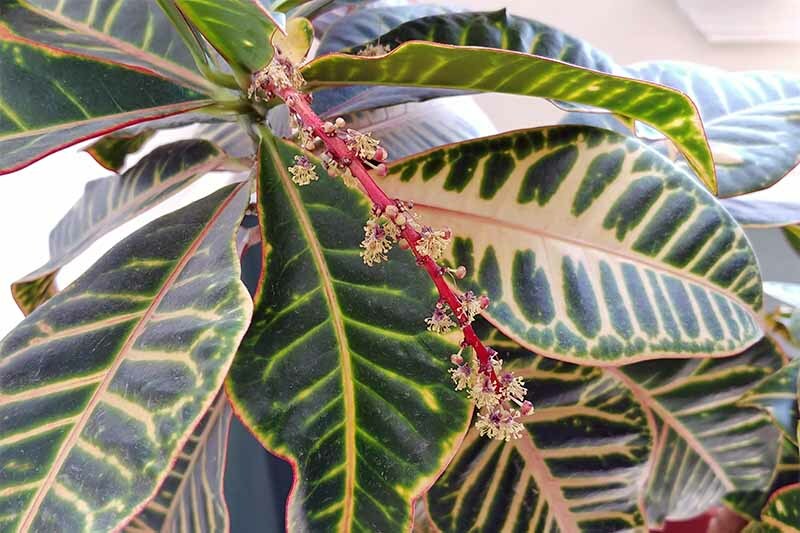 Croton flowers are tiny, blooming down the length of a long stalk. Photo by Nan Schiller. Center your plant in the new pot, at the same depth it was in the old pot. Holding the plant with one hand, use your other to fill in around it with potting medium. 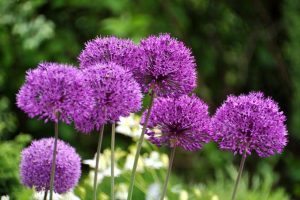 Don’t fill to the top, but rather, leave a little space to prevent watering spillover. Tamp down gently, water, and tamp again. Your freshly repotted plant may droop or drop leaves until it regains its composure. 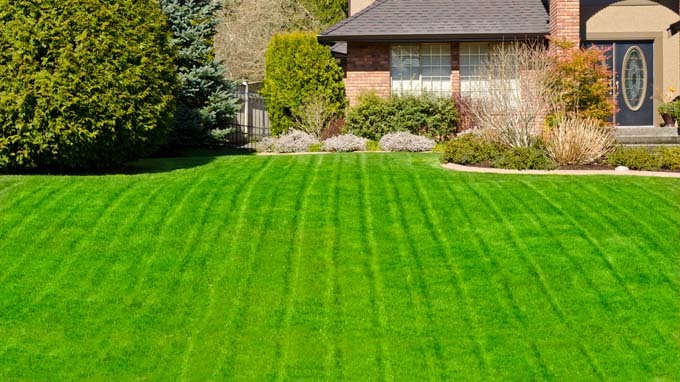 Give it time to acclimate, and resist the urge to fertilize for at least a few weeks. 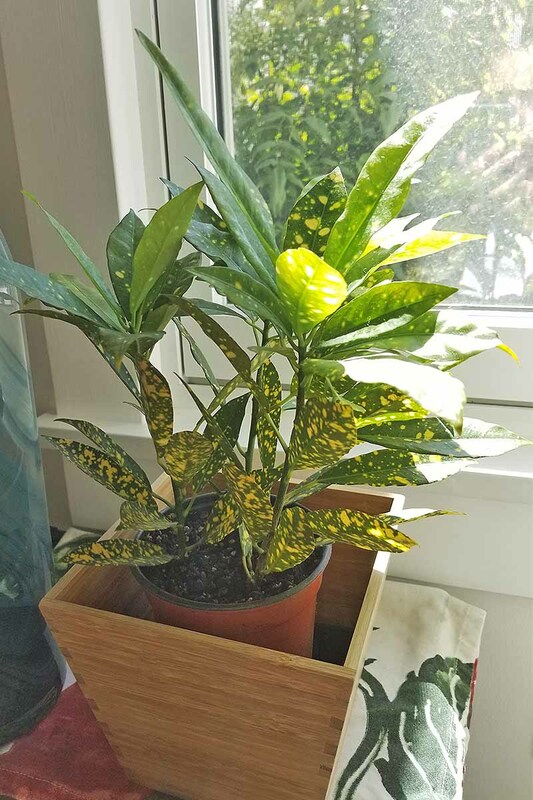 A small C. variegatum aucubaefolia ‘Gold Dust’ with a spotted pattern, in failing health after repotting. Photo by Allison Sidhu. To prevent transplant shock, you can also water with tepid rather than cool or cold water. 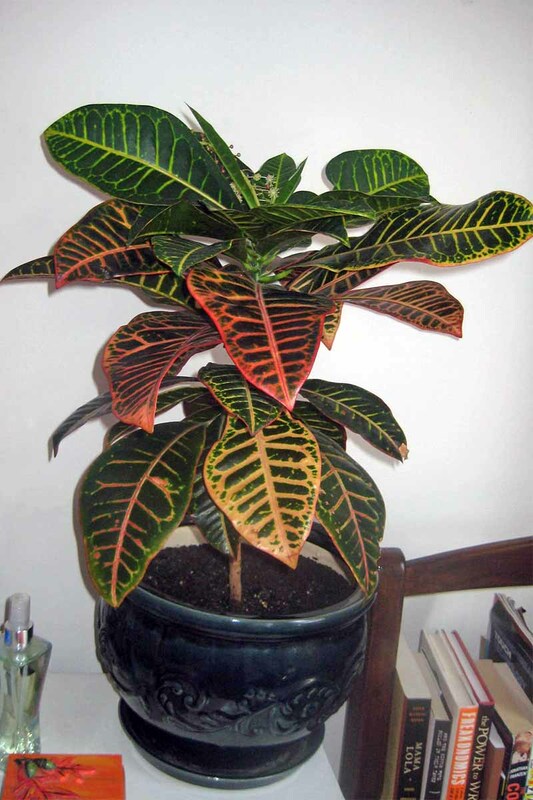 A healthy croton is not prone to disease or insects. 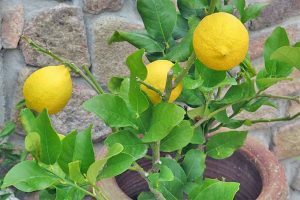 However, a plant weakened by too much or too little water, or one that is shocked by a change in environment, may be vulnerable to aphids, mealybugs, scale, or spider mites. The same plant before it was repotted, in better health. Photo by Allison Sidhu. 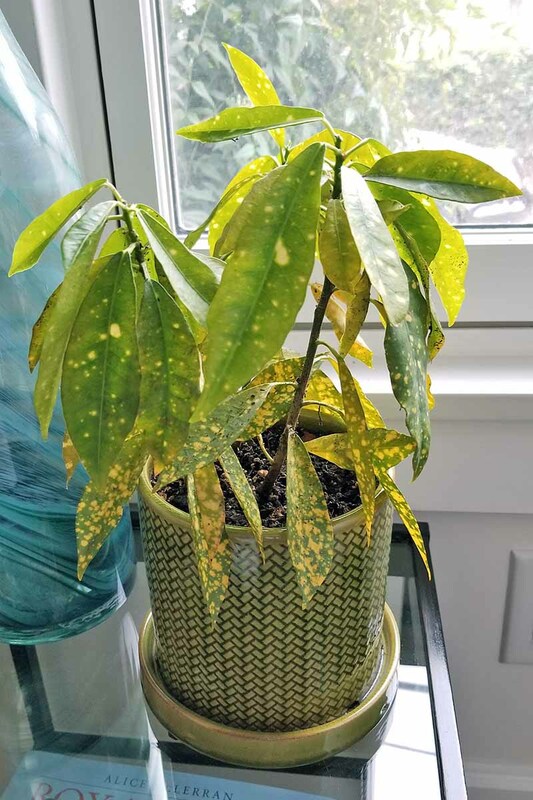 Periodically wipe your plant’s leaves down with a soft, damp cloth. 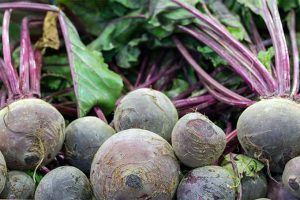 You’ll not only keep them glossy, but if there’s trouble brewing, you’ll see it right away. And if you do notice pests, try spraying them away with neem oil, available on Amazon. 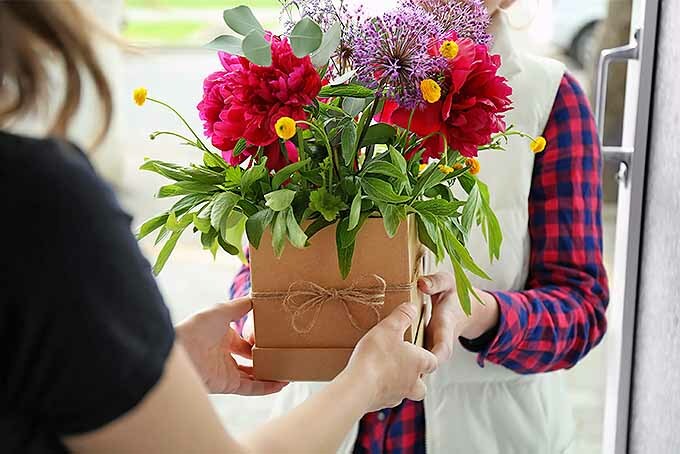 Friends are sure to admire your new favorite houseplant, so why not try your hand at propagation so you can give them one of their very own? Wear gloves to prevent contact with stem sap, and select a branch with new growth. 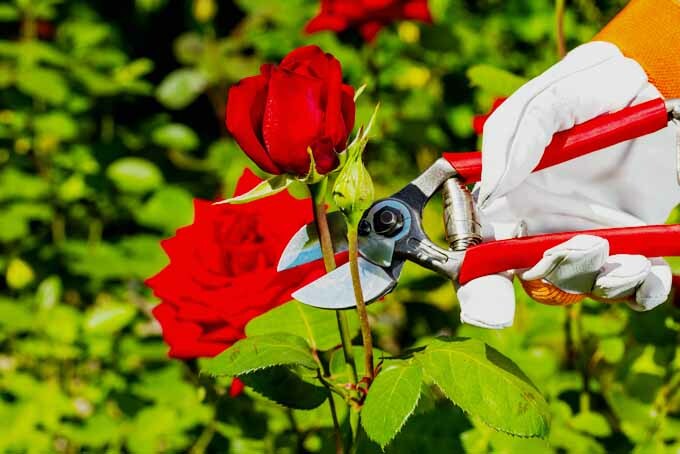 Use shears, like our favorite Felco F-2 pruners, to make a clean cut cross the branch about six inches below the tip. 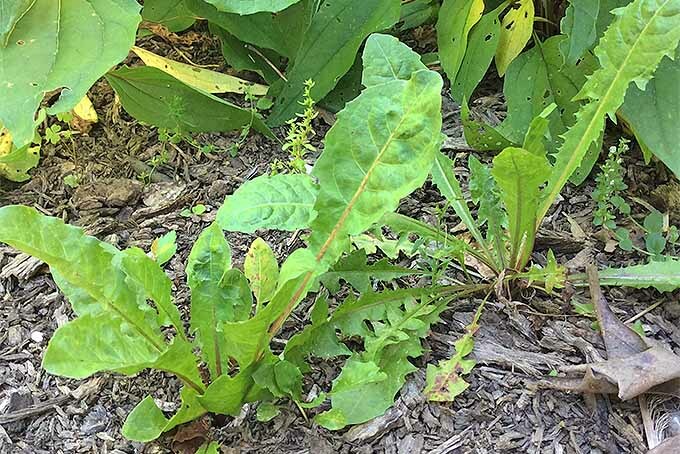 Remove the lowest leaves, if necessary, to reveal at least an inch of stem. 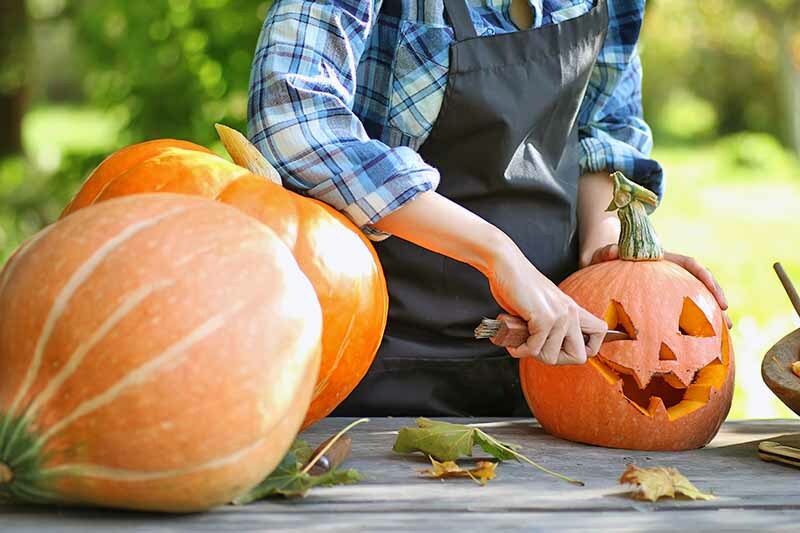 Place your cutting in water or rooting medium until roots form. This may take several weeks. When roots have developed, pot as described above, and your new plant (or plants) will be ready to go! 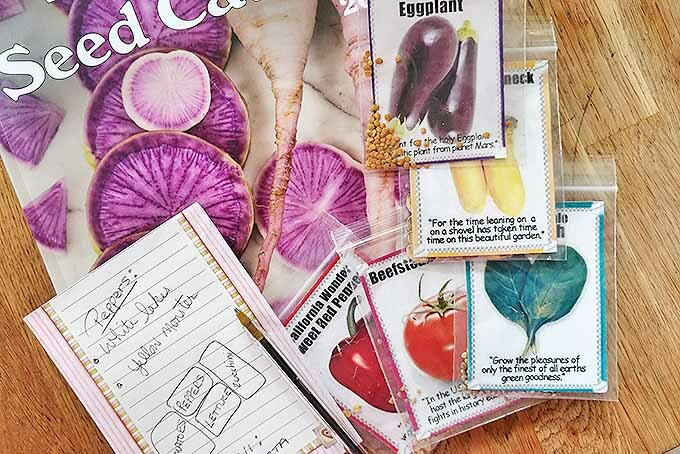 There are so many different cultivars to choose from, it’s going to be tough to pick just one! C. variegatum ‘Petra’ is available from Jet.com in a 4-inch pot. Elliptical green leaves are lavishly veined in yellow and red. C. variegatum ‘Sunny Star’ is also available from Jet.com in a 4-inch pot. Elongated green foliage has yellow accents. 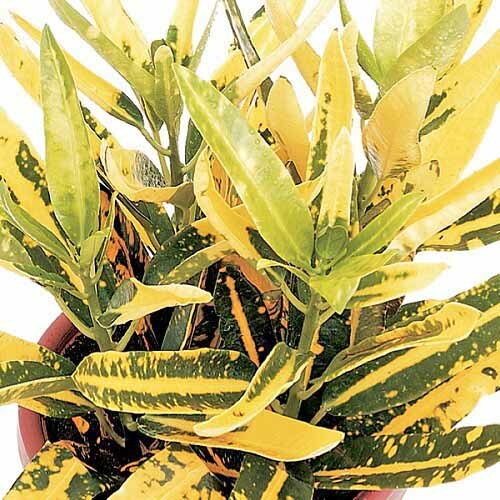 C. variegatum ‘Mamey’ is available from Jet.com as well, in a 4-inch pot. 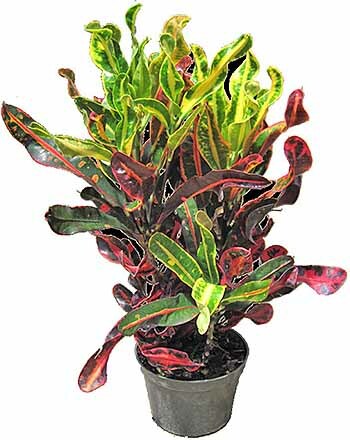 Multi-colored, twisting, elongated leaves are accented with red and yellow. 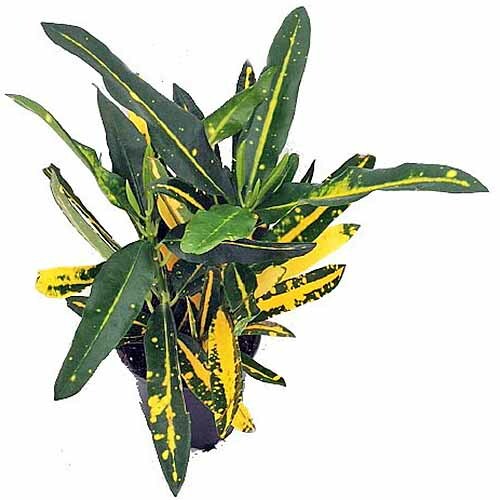 C. variegatum ‘Banana’ is available from Jet.com in a 4-inch pot. Elongated, twisting leaves are speckled and veined with yellow. C. variegatum ‘Petra’ is available from Amazon. 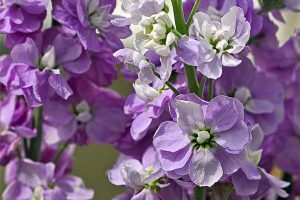 Ten-inch plants come in two pot sizes, 6 or 8.75 inches, in a grower’s pot for replanting or in a decorative pot suitable for indoor use. 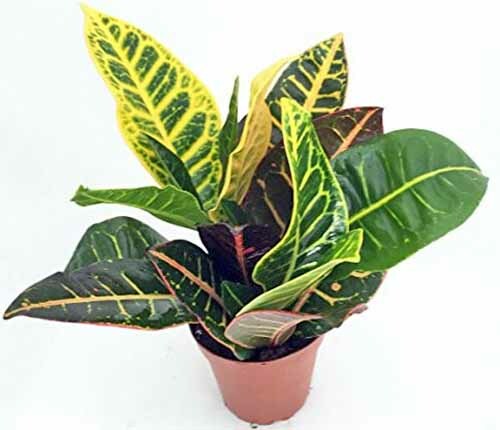 And for those who can’t pick just one, 4 assorted C. variegatum are also available from Amazon, in 3.8-inch pots. 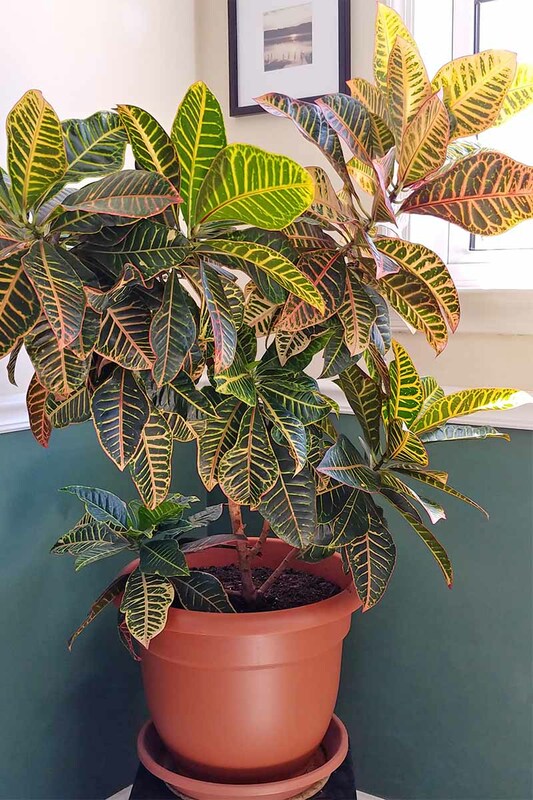 I know you’re going to love having a garden croton in the house. Let me tell you about the one that lives at ours. Jules came home in May and went back to school in August for four years, and never dropped her leaves. This girl was a champ! After graduation, Jules came to live in my daughter’s empty bedroom, the sunniest room in the house. All was well until the day I went in and found her down to one leaf. Did I forget to water, or was she unhappy with her new surroundings? The same plant, when it was smaller. 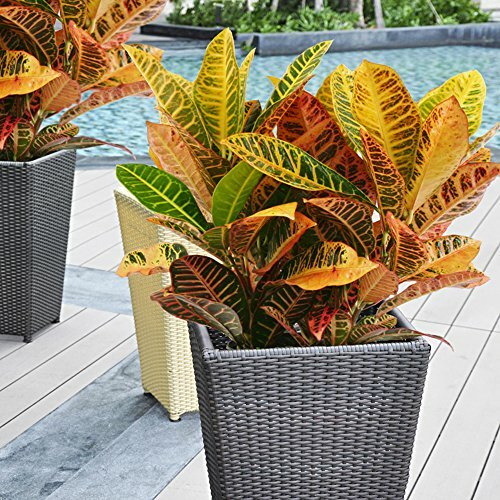 Notice that the snake plant pictured in the image above is now growing in this pot! Photo by Allison Sidhu. 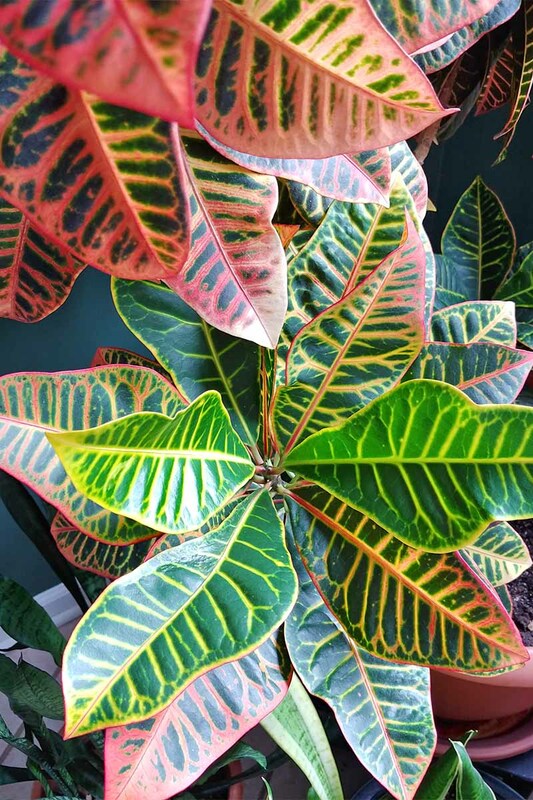 Either way, I am happy to report that crotons are quite resilient, and with a little TLC from my dad’s very green thumb, Jules made a full recovery. Now, at the ripe old age of 14, she occupies her own corner of the dining room. 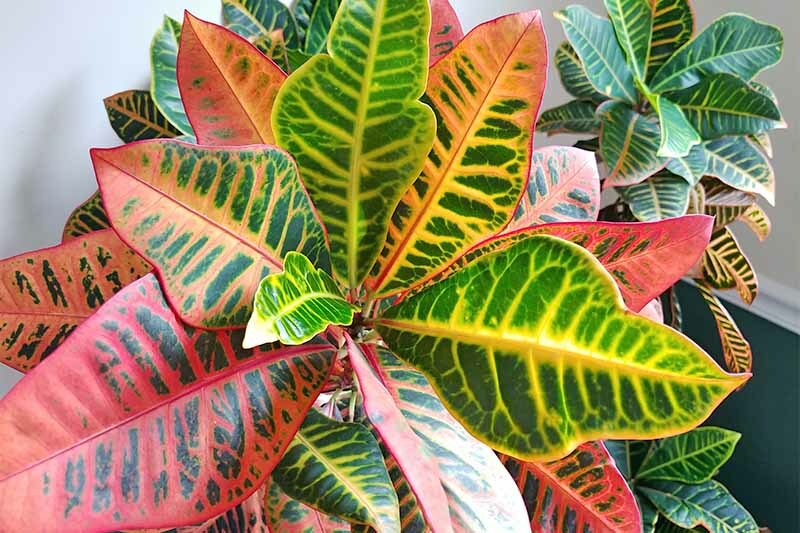 If you’ve never grown a big houseplant, now’s the time to make room for garden croton. It’s sure to become part of the family! 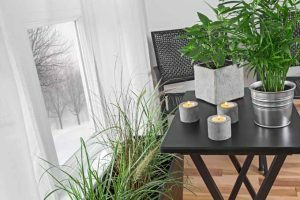 For more on houseplants, check out our Houseplant Primer, and feel free to share your comments, questions, and advice in the comments section below. Photos by Nan Schiller and Allison Sidhu © Ask the Experts, LLC. ALL RIGHTS RESERVED. See our TOS for more details. Product photos via Newhouse Lighting, Miracle-Gro, Garden Safe, Costa Farms, and Jet.com. 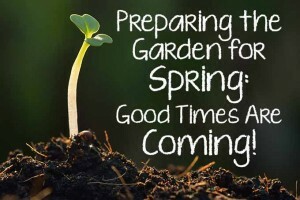 Preparing the Garden for Spring: Good Times Are Coming!